This is what I know about Hipster Death Squad: The group is from Winnipeg, Canada; they are unsigned; one member appears to be Michael Glucki; and there may or may not be additional members. Oh, and they play really good electro-rock, pop and chillwave, featuring well crafted rhythms and soulful singing. According to one source, the instruments used by Hipster Death Squad include guitars, bass, drums, synths, rhodes, B3, melotron, harmonium, melodica, recorder, piano, percussion, backing vox, and keyboards. We invite you to become familiar with the band's music--the September and December EPs and the November single all are embedded below. If you like them, you can download them free. That may be the best Black Friday weekend sale you get today. A tip of the cap to Lloyd, founder of the Peenko blog from Glasgow, which is how I found out about this band. New Video for Bwani Junction's "Two Bridges"
And here is a bit of background on the video. Aussie garage rockers Bleeding Knees Club produce euphoric garage rock with just the right doses of swagger, sneer and sleaze. And they are very good at it. The band is "Alex Wall, Jordan Marlane and Matt Woods". They remind me of the Black Lips, but whether you agree or not, I think you'll enjoy them. The Soul Corner - "99 and a Half (Won't Do)"
We are an apolitical forum here, so this is offered without much commentary. For me, it's a slamming musical moment with no need for further embellishment or any contextual analysis be that contemporary or historic. My principal message today is that Mavis Staples is an American treasure, as good as it gets. The lyrical turn that Mavis gave it in her version is fantastic. But love, liberty, respect, it's the same - 99 and 1/2 just won't do. Just won't get it. We are thankful to all of you for indulging our little hobby here. For our international readers, today is Thanksgiving Day in the US, a family oriented holiday where we cook all day, gather in large groups to eat bland American food, watch football and a big parade in New York City on TV, and are thankful for the many good people and blessings in our lives. In my house, we also listen to American music. Some songs of various givings of thanks from some WYMA artists. I've lauded Glasgow's glorious dirty surf group She's Hit a few times this year, including this review of their excellent debut album, Pleasure. Their label, Re:Peater Records, recently advised me that Pleasure is available for digital download on the major sites, and for streaming on Spotify. A link to the US Amazon page for the album is here. And in case you're hesitating, here is the official video for one of the album tracks, "Part One". And if you've already bought the album, enjoy the video--you deserve it. Another Re:Peater Records album that impressed me greatly this year is Luck by Jacob Yates & the Pearly Gate Lock Pickers. I loved it when I reviewed it, I love it now, and I'll love it when I make my year-end list. For the readers who want a bit of Luck, but didn't get a physical copy or purchase from Bandcamp, this album also now is available via the major on-line sites and Spotify. The US Amazon link is here. For a reminder of doom wop sound of JYatPGLP, here is album track "Can't Stop". Here is album track "Mary Hell" live at Stereo in Glasgow last Sunday night. Get to know two bands whose only obvious connections are the state of California and a name beginning with the letter "P". Arguably, both bands work the garage space, but Palmz is lo-fi, doo wop sugar and POW works the punk end. But there is no reason to choose. Both are good in my book. Palmz is from Santa Cruz, California. The members of the band are Lexie Corfiatis (vocals, guitar, bass), Devin Eiring (drums), and David Conner (guitar). The delightful "Teenage Heartthrob" is from their 2009 release X-Ray of Fun. The three-person POW is from San Francisco. Their only release on Bandcamp is the two-track Pretend There, which you can enjoy below. They spice up the garage punk with a sonic synth blast. Not that it was noticed, but the jealous exigencies of the real world jammed me up good for 5 or 6 weeks of the past couple of months, such that I couldn’t post anything. All that time I was listening to a few new things that I’m hoping to get around to writing something about in the next couple of weeks, but on a daily basis I felt myself being pulled into one record I just couldn’t get out of my head – not that I was trying. It was the new album from Eugene, Oregon's Yob, called Atma, a five song, 55 minute maelstrom that I swear, if you give it the time and attention it deserves, will be on your year-end list regardless of where your music tastes currently dwell. It was released a couple of months ago by Profound Lore. I’m not so naïve as to expect that the regular visitors to this forum come here to get a metal fix, and despite that I’ve deeply loved the genre since I was a pre-teen, I confess to being a philistine when it really comes down to it. Still, I’m probably listening to as much metal now as I have since I was a kid, when my steady diet of Zeppelin, Sabbath and Priest abruptly gave way to Killing Joke and then to punk, causing me, with few exceptions, to lose touch for the next 15 years. Thank goodness life is long. Yob is the creative outlet for Eugene singer-guitarist Mike Scheidt, and the band has released five studio albums since 2003. They are variously categorized as doom, sludge, or stoner metal, in that their songs are not 3-minute Converge-style metalpunk amalgams, nor are they the 6 minute solo-filled scorchers so well-covered by the likes of Matt Pike and Trey Azagthoth. This is not to suggest Mike Scheidt is less than a brilliant guitarist. He demonstrates several times on this album that he’s fully capable of a gripping solo, but the most fascinating and rewarding guitar work on Atma can be felt in the tension Scheidt creates between the low-register bar chords and the bright bursts of sound that flash out of the sludge. He has credited his Brent Monson guitar for the beautiful sound he is able to get on the record – and it is uniquely beautiful. These songs take time to develop, and they take several listens to know, but they are thoughtfully composed by an artist who has considered every measure. I am well aware I’m asking a great deal of a reader to request that he or she listen carefully to a ten minute song from a genre he or she doesn’t give two craps about, but I’m going to throw a couple of them up here and urge you to pour yourself a drink (a big freaking drink, these are long songs), isolate yourself, and let the noise take over. If, after a couple of minutes, you feel like turning it off, what you really need to do is shut the hell up and turn the volume a couple of rotations higher. This is the album opener, “Prepare the Ground”, which starts with a primal chord progression leavened with that Monson sunburst, and then progresses into something highly violent that will make you think the guitar is actually fighting back . This video is from a live show in Spain a couple of months ago, but the sound quality was bad, so they subbed in the album version. Doesn't match up perfectly, but it's better than looking at an album cover for the whole song. Enjoy it. Not to be undersold here are Scheidt's vocals, which at times sound like Ozzy channelling 220 volts, and at times sound outright bestial --for example, about 6 minutes into my favorite song on Atma, "Adrift in the Ocean." This tune (the album version is below) again illustrates that terrific interplay of sludge vs. burst he's getting from his guitar. Come on, folks. Whatever your aesthetic leanings you need to buy at least one metal album every year. If you're limiting yourself in that way, make this beautifully conceived, beautifully executed, and exceptionally violent album the one. After about 5 listens, you'll be trying to figure out where to find more. The newly renovated Neptune Theatre in Seattle's University District hosted The Posies Saturday, November 19, with supporting acts Star Anna & The Laughing Dogs and Curtains for You. I'll address the headliners first. From time to time one reads of The Posies being a power pop act, or a pop act. But for me, their set was a satisfying reminder that The Posies are a rock band, albeit a rock band with very well developed pop sensibilities. The band was a four-piece, with Jon Auer and Ken Stringfellow--both excellent, and enthusiastic, guitarists--ably supported by a bass player and a drummer. And with the bass was well up in the mix, a mic inserted in the kick drum, and Jon and Ken providing a near constant electric assault, the Neptune was rocking. 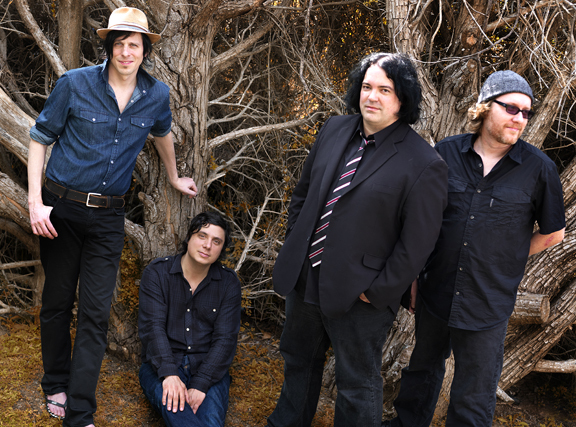 That isn't to say that The Posies eschewed their well-renowned vocal harmonies, or that there were not some quieter moments. But for most of the evening the harmonies rode a very robust musical wave. I didn't try to keep track of a setlist, but I recall that we heard tracks from the newest album, Blood Candy, as well as Frosting on the Beater standards "Solar Sister" and "Flavor of the Month". Frosting on the Beater is a favorite of mine. Not only was the music first rate, but along with Teenage Fanclub's slightly older A Catholic Education and the somewhat later early albums by The Delgados, we could enjoy rock with pop vocal stylings and clever songcraft. However, the one of the true joys of The Posies is that they continue to refine and evolve, and the concert would have felt incomplete if the evening had just been a nostalgia exercise. And since the live version of a song rarely sounds the same as the studio version, I was especially happy to hear recent songs that I'd only hear on CD before the evening. Rest assured, they sounded great. The Posies set was more than generous. I think it clocked in at 1:45, with a short break after about an hour. It is hard to pick out highlights, but I particularly enjoyed "Flavor of the Month", "Solar Sister" and "She's Coming Down Again". And it was a nice change of pace when only Ken and Jon were on stage to sing together, as it gave the harmonies a bit more space. The Posies still put on a good rocking show, and I was amazed at how well they transition between songs and blend together with no obvious communication. You'd be well advised to consider them if they are appearing in your neighborhood. I reviewed this band's most recent album a few months ago, so I was interested in hearing them live. I walked away even more impressed with their live show than I was with their very good album. Star Anna's vocal delivery is a stunningly good, and the band is excellent, individually and as a unit. The band consists of a drummer, bass, keys, and lead guitar, with Star Anna playing the guitar on many tracks as well (for the record, the line-up is Star Anna, Justin Davis, Travis Yost, Keith Ash, and Ty Bailie). The sound generally is a country-noir rock sound. But it seems to me that the set rocked out more than the album, which pleased me and provided the perfect warm up for the headliners. If this band has the ambition, and necessary bit of luck, I think folks outside of the Pacific Northwest will be hearing a lot from them. The first band, Seattle’s Curtains for You, were completely unknown to me, and I'll have to admit that I didn't pay a lot of attention to them during their first few indie rock standards. They were energetic but I didn't feel very connected to them. However, a few songs further into the night I began to enjoy their performance. All are very good musicians: Peter Fedofsky (keys, vocals), Mike Gervais (lead guitar, vocals and some sax), Matthew Gervais (lead vocals, rhythm guitar), Dave Lawrence (drums), and Nick Holman (bass, vocals and some horn). As their set evolved, they demonstrated vocabulary of musical expression far beyond that of an indie pop band. To be fair to these guys, and since I'm based in Seattle, I'll have to give them another look. If I say so myself, this is a good session for the New Sounds of Scotland series. We have new music from two bands we've profiled int the past -- The Spook School and Dolfinz. We also have a great-sounding song from a mysterious group named Berlin Heart which is a delicious mix of Link Wray, The Velvet Underground and The Dirty Beaches. The Spook School is an Edinburgh indie/pop band with a delightful sound an always amusing blog (linked below). They just released a very nice two-track album entitled Are You Who You Think You Are? We profiled Scottish two-piece Dolfinz earlier in the year. They are on our radar again with a two-track 7" Teenage Doom / Nosebleed 7", a very good fuzzy, punky noise pop set. A Berlin Heart is a medical device used when a heart is failing. It also is the name of a Glasgow band that doesn't really want us to know any more about them at this point. Berlin Heart -- the band, not the medical device -- has released this wonderful bit of dark, minimalist, dirty surf to get us in the mood for the holidays. The name of the song is Blanket Over Sky. By the way, the song is released on Re:Peater Records, who also released the She's Hit and Jacob Yates & the Pearly Gate Lock Pickers this year. In last week's review of Fully Cocked by Bwani Junction, I wrote that the album was available on Amazon and iTunes. It appears that a barcode error resulted in that information being correct. However, the error has been corrected and the album is available for digital purchase at both sites. We proposed to sacrifice a virgin in atonement for the error, even though it wasn't our fault. But no one at the WYMA offices, including contributors, staff and interns, is a virgin or even admits to knowing any virgins. Accordingly, in the manner of the best bureaucratic operations worldwide, we have resolved to never speak of this matter again. Here are a couple of links you might find useful. To my ears, "Sailing" is unmistakably a Seapony song, which certainly is not criticism. However, the sound has been embellished by hand claps and xylophone which add nicely to the overall effect. New Centro-matic videos - "Shadow, Follow Me" and "Devil On The Interstate Line"
If you don't have either or both of these records yet, well, I don't know why. If you do, tell your friends.